The American DJ Jellyfish has a new member of the family, the Jellyfish Jewel. The Jellyfish Jewel is like the younger sister of the Jellyfish and is a slightly smaller. The Jewel, like its older brother, has the wild translucent case that glows with multi-colors as the unit sends out beams of light. This gives it that trademarked “jellyfish” look. 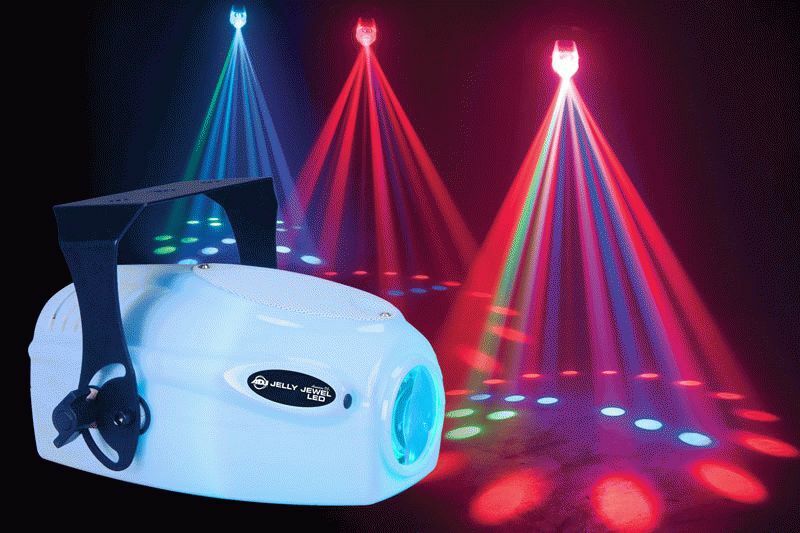 The Jellyfish Jewel is the “techy” version of the old jewel light that DJs are familiar with. Unlike the old jewel, the Jellyfish jewel has no moving parts and relies on a built in computer and 46 powerful LEDs (16 Red, 10 Green, 10 Blue & 10 White) to create what appeared to be unlimited patterns to the beat of the music. This updated version of the trusty jewel light will never have a motor or bulb burn out or a mirror wheel fall off. I have actually have had that happen a couple of times over the last 20 years or so. For what I would consider an accent light, filler light or a light you can just keep in the van just in case you need some lighting, the American DJ Jellyfish Jewel swims to the forefront. It’s bright enough and has a spread large enough to cover most rooms. If the specs are correct you could use this at one event a weekend and it would will last for about 320 years.